The clip features studio footage and images from the 97-minute movie documentary, “From Here To InFinite”; the movie is part of the limited CD+DVD edition of the album and will be released this Friday, March 10 as limited-edition CD digipak, limited 12-inch maxi vinyl and digital. “All I Got Is You” follows the project’s lead track, “Time For Bedlam”, as the second tune issued in advance of the April 7 release of the group’s twentieth album. Deep Purple recorded “InFinite” last year in Nashville, TN with producer Bob Ezrin, who also teamed up with them on 2013’s "Now What?!" "Working with Bob," says singer Ian Gillan, "he said ‘I’d like to hear you just stretch out and play as you used to do .. and the way you play on stage.’ Wow, it was like someone opened a door and we went through it – and it was just like the old days." 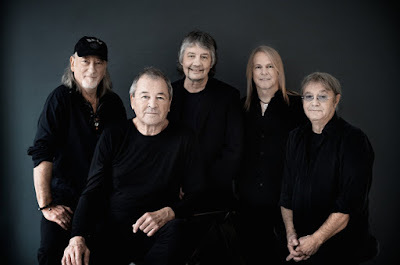 Deep Purple will support the record with shows on “The Long Goodbye” tour, including spring and summer shows across Europe that begins in Bucharest, Romania on May 13, followed by a late summer run across North America with Alice Cooper and a series of UK dates in November.